Recognized on the SAY 100: Voices the Shape Opinion List! 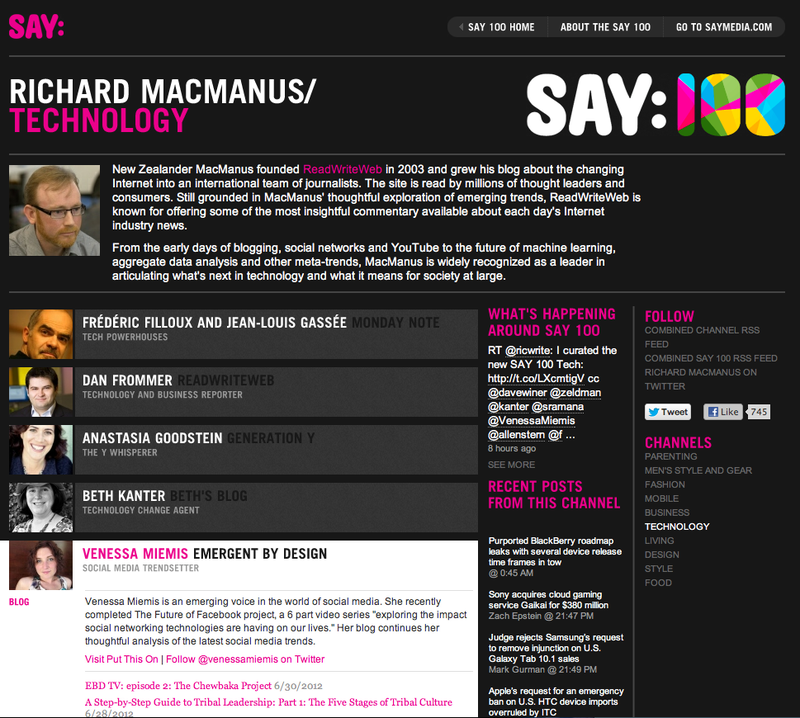 I just saw a tweet go by from Richard MacManus, founder and editor-in-chief of ReadWriteWeb, saying he curated the new SAY 100 Tech list — and was honored to see my name within those 140 characters! The SAY 100 is a collection of authentic and knowledgeable online voices that create engaging content, drive conversation and shape opinion. At SAY Media we believe the power to shape opinion is shifting from the faceless editorial voice of mainstream media to individuals, many of whom are taking advantage of simple technology to create their own properties and build their own media brands. Thank you, Richard, for thinking of me! Congrats on the first of many such honors! I’ve been lurking and following you for a long time now and have suggested you to anyone who would listen. Congratulations! You deserve it, you’ve offered an excellent example to us all by diving in the deep end and exploring, and it’s so nice to know you’re being recognized as the force of nature you are. Very well deserved Venessa! You inspire me with stunning regularity!